Side-by-side, the Red-shouldered Hawk is a bigger bird with a longer tail - one that extends well beyond the primaries when perched. The thick malar smudge can be seen on both species at this age, but is a bit more conspicuous (and is retained longer) on a Red-shouldered Hawk. At this age, some slight reddish tones may be begin to appear on the shoulders of the Red-shouldered Hawk. Broad-winged Hawks remain brown all over. Status and Distribution: Red-shouldered Hawks are fairly common permanent residents throughout the area, particularly around wet lowlands. Broad-winged Hawks are common migrants and rare summer residents. 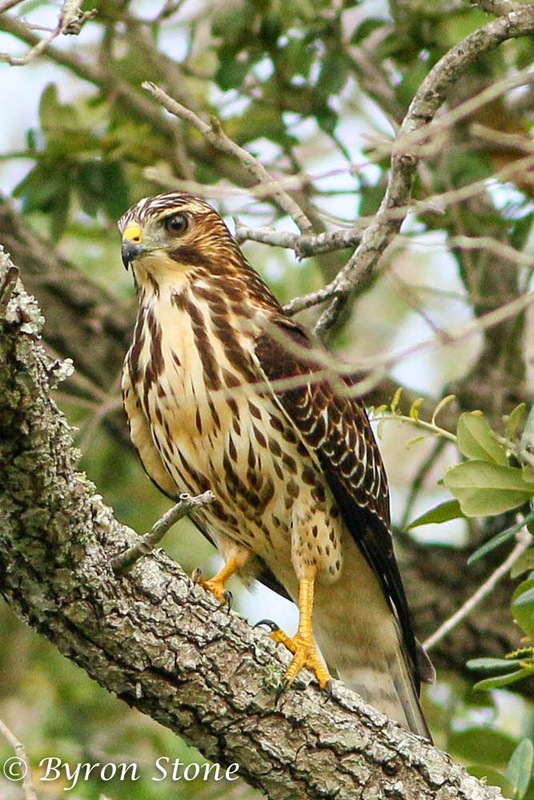 A few winter records of Broad-winged Hawks have occurred along the coastal bend region of Texas. No winter records have even been reported from North-central Texas.